Housing construction in Sydney and Melbourne is headed for a major slump, hit by apartment oversupply and credit tightening, according to industry analysts Macromonitor. The downturn is already underway at a national level, with Macromonitor forecasting a total decline in dwelling starts of 23 per cent from the peak in 2016 to a trough in 2019. 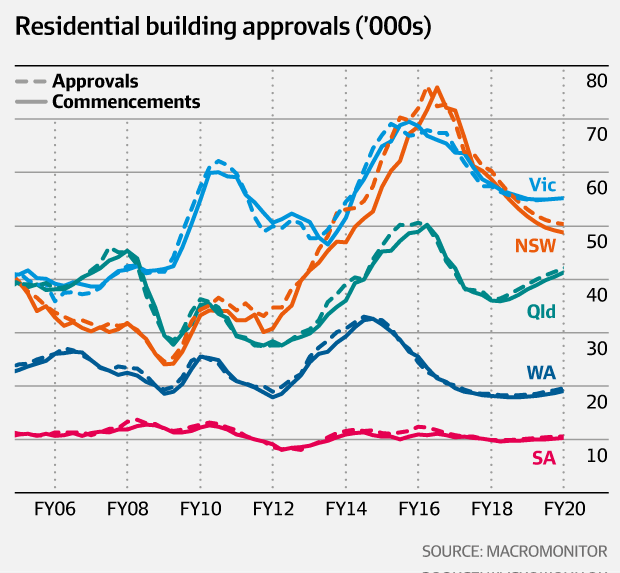 “The regions affected by the mining downturn led the way with big falls in residential building from 2014, and the downturn has progressively spread across the nation, with the exception of the remaining strongholds of Sydney and Melbourne”, said Macromonitor analyst Nicholas Fearnley. In New South Wales, dwelling starts are forecast to drop by 32 per cent between 2016/17 to 2019/20, according to the Macromonitor report. A fall of 24 per cent is expected in the detached housing sector in NSW, with a 38 per cent slump in attached dwellings. 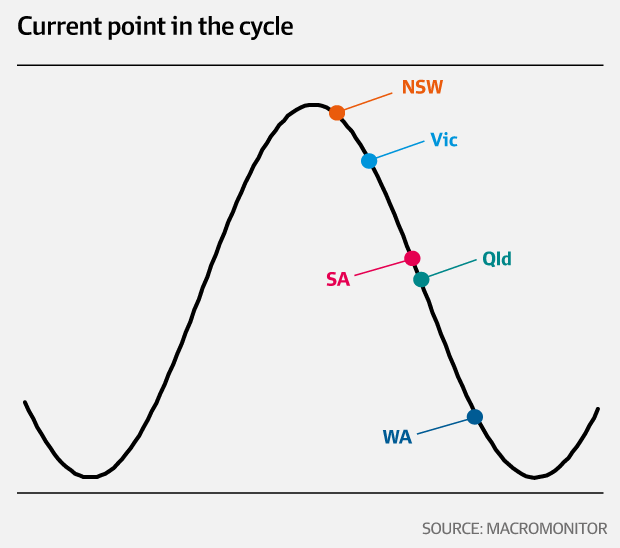 The sector will not recover in NSW until 2022/23, according to Macromonitor. In Victoria, the outlook is grim as well. Total dwelling starts are already in retreat, dipping by 4 per cent in the 2016 calendar year. Another 7 per cent drop is expected in 2016/17 and a further 9 per cent in 2017/18. This downturn is will hit the attached dwelling sector hardest, with a decline in commencements of 30 per cent forecast between 2015/16 and 2018/19. Detached housing starts are expected to fall just 11 per cent over the same period. Not until 2022 will Victoria’s residential construction sector begin improving, driven by employment and population growth. Nationally, the residential building sector one quarter of the way through a major cyclical downturn, according to the Macromonitor analysis. “The current extreme levels of building are not sustainable, and the downturn will be driven by oversupply, primarily affecting apartments, combined with tighter lending criteria and falls in foreign investor demand”, Mr Fearnley said. The latest forecast comes on top of a dire outlook for the construction sector posted earlier this month by industry peak body, the Australian Construction Industry Forum. The construction industry could shed as many as 166,000 jobs over the next three years as a deterioration in engineering construction dovetails with the slump in residential building, according to ACIF. In the broader housing market, analysts are already embracing the prospect of a downturn as combination of factors – including curbs on investor lending and the new bank levy – weigh on buyers.